If you have been issued a speeding ticket or traffic ticket returnable to the Montebello Village Court, give us a call to learn how we can help you save time, money, and points on your license. Our Montebello speeding ticket lawyers have over 30 years of legal experience and we have helped thousands of drivers fight their traffic tickets. Give us a call today to schedule your confidential consultation. We can be reached locally at 914-723-7900. When a driver enters a timely not guilty plea, the court will mail them a letter advising them to appear in court for a pre-trial conference. The time to receive the letter may vary. It can take several days or even several weeks to receive a notice to appear in court. It is important to stay vigilant and keep a watchful eye for the court notice. If a driver misses their court date, their privilege to drive can be suspended. Most drivers’ first physical contact with the court will be at a pre-trial conference. The pre-trial conference is an opportunity for the driver to meet with the prosecutor and discuss the merits of the case. The pre-trial conference is not a trial date. As such, formal evidence and testimony will not be submitted. A pre-trial conference is meant to be a brief meeting with the prosecutor. New York State Troopers are not required to be present at the pre-trial conference. What Should I Bring to Traffic Court? In general, bringing witnesses to a pre-trial conference will be a waste of time. If you bring any supporting documents, it is important to have them in an organized manner in such a way to easily show the prosecutor. An example of some supporting documents that will be helpful at a pre-trial conference will include proof of repair for an equipment violation and proof of insurance for an insurance charge. What Happens When Entering the Court? The court is a secured facility. All attendees will be greeted by a court officer and could be subject to a search. Upon entering the courthouse, drivers will be instructed to sign the attendance roster located immediately to the left of the entrance. Where do I Go After Signing In? Once you entered the court, the court officer will instruct you to have a seat and wait to be called by the Village Prosecutor. Once your case is called, you will have an opportunity to meet with the prosecutor and present a cogent argument. What Will Happen if the Case Cannot be Resolved? If your case cannot be resolved at the pre-trial conference, your case will be adjourned for trial. At trial, the officer will be required to appear in court and testimony will be taken. Drivers are not entitled to jury trial for a non-misdemeanor traffic ticket. At the trial, the judge is the finder of fact. 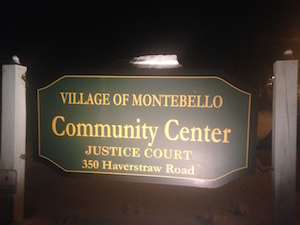 Montebello Village Court is located at 1 Montebello Road, Suffern, and N.Y. Its postal zip code is 10901. It is conveniently located a few miles from Interstate I-87/I-287. About Our Firm: Our law firm has over 30 years of legal experience and we are led by a former prosecutor. We have been recognized as some of the finest lawyers in the State.